I used to pride myself on a clean house. Little did I know, it was going to get much more complicated once I became a mother. Fast forward a few years, and I am a stay at home mom to two darling little children, ages 1 and 3. (Update: I now have three kids!) Boy, can they make a mess! Not only does having kids naturally create more mess to clean (and more laundry), it’s harder to get things done. 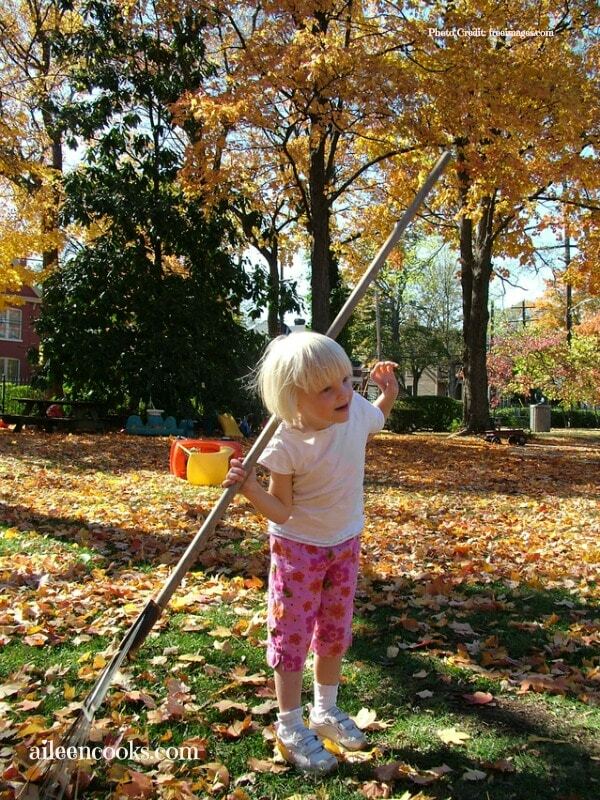 Tasks as simple as mopping the floors or making dinner take more time and tend to get dirty faster. 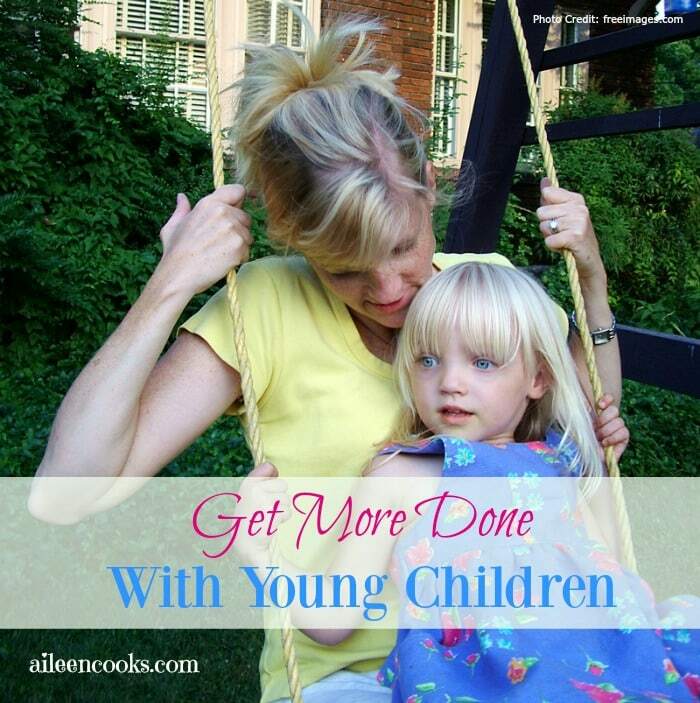 I’ve come up with some strategies to get more done – with little ones in the house. This may seem counter-intuitive at first, but they are less likely to act up or demand your attention if they are with you. The simplest way to include your child is by giving them a job. You know I am a fan of including them in the cooking duties, but there are many other ways they can help. If you are folding laundry – give them a small pile to “fold”. Babies love it when you narrate what you are doing – if you talk to them while you’re wiping down the counters, they are more likely to sit happily while you finish up. This is a given with little babies, but toddlers can be worn, too. I don’t know about you, but my child attaches herself to my backside every time I make dinner. Like literally holding on to my backside as I slowly scoot around the kitchen. If I am wearing a long shirt or dress, she sticks her head under my clothes, too. My toddler is much happier when she can ride on my back. (I have this Ergo and LOVE It) She is close to me and can see what I’m doing without being too close to the stove or cleaning products I am using. Save a box of special toys for when you are working, cleaning, cooking, <insert task here>. If there is something you have trouble completing on a regular basis, set aside a few special toys your child can only play with while you complete this task. They will stay occupied for longer if it is a toy they don’t have access to all the time. If possible, plan on waking up before your child. (yes, this means going to bed earlier). Think about what you want to accomplish in 30 minutes and make that your goal. Start a load of laundry or dishes and enjoy your coffee in a quiet, peaceful house. You will be much more ready for the day if you start it out with some quiet time and cross some things off your to-do list right away. I know one Mom who intentionally allows her children to make a mess throughout the day and just does one big clean up at night. Turn on some music and have your kids help you pick up their toys. Make it a game to see who can clean the fastest. Cleaning up before bed means you have less to do in the morning. Make a point of loading the dishwasher before bed and wiping down the counters. A tidy kitchen can make a world of difference for how you feel about the state of your house. I want to make one last point, my house is messy most of the time. I spend much more time blogging at this point than cleaning (sorry hubby! ), but you can get more done if you give yourself a plan of attack. Most importantly, give yourself a break! It’s okay if your house isn’t spotless or there is always laundry to fold. It took me a long time to come to terms with it – but it’s the truth. Your house is not the same after having kids, and that’s okay. I wouldn’t want it any other way! 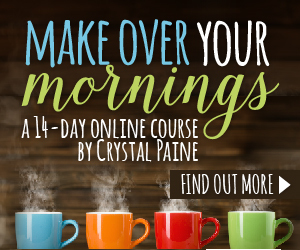 Another thing that has helped me is Crystal Paine’s Make Over Your Mornings eCourse. It’s a 14 day course designed to help you create a routine that makes your life less hectic and stressful. And when I say eCourse, I mean you spend between 5-15 minutes per day on it – you do not need a lot of time, which is huge for me! It’s all done at home at your own pace, so it’s been really easy to fit in. Crystal is such a big motivator for me as a homemaker and as a blogger, so I knew I was going to love Make Over Your Mornings. If you’re curious about it, Crystal is offering free access to day one (just scroll to the bottom). 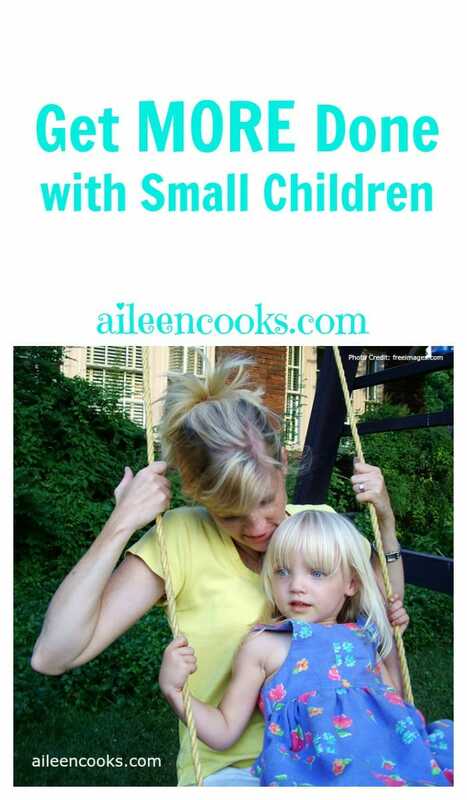 How do you get more done with small children? Note: This post contains affiliate links. See my disclosure policy here. I have a 6 year old, a 5 year old, a 3, a 2, and almost 4 month old twins. DO NOT WAKE UP EARLIER! 😀 Just learn to let the deep cleaning go. Thank you Marie! I am all for letting things go! I totally want 4 kids someday ? I just reread your comment and you have 6 kids not 4 whoops! That’s awesome. Your heart must be very full! YES to strapping them on and getting up earlier! I don’t know what I would do without my baby carrier and as far as getting up early – well – I need to mentally get myself into the game before the kids are up and at ’em! Great tips. I love that you mentioned you have an Ergo, I love mine and it helps me so much with my 2 year old, I am so glad that I can still wear her when I need to, great tips! Yes! My daughter will be two later this month and she still loves riding in the Ergo! I like your idea of keeping a special box of toys that you only break out when you need a little distraction! I love that you recommend toddler wearing. I would not make it through a day without it. And, I love my Ergo as well. Ergo’s really are the best!!!! That’s where I am at, too! It may take a bit longer, but it keeps them happy and teaches life skills. These are great tips! It is really hard to be productive with small children.